Every interaction your buyers have with your brand leaves an impression. Over time, these impressions add up, providing you with a wealth of insight into the patterns and habits of your customers. The problem is that the majority of small- to medium-sized businesses don’t track these impressions as well as they should. Of those that do, most aren’t using the information they gather to its full potential. Why Is Data-Driven Marketing Important? Let’s get clear on what data driven marketing is before we go any further. Data-driven marketing is the use of informational insights into your customers’ shopping and buying habits in the optimization of your marketing activities. In other words, it’s tracking your customers’ behavior leading up to, during, and after a purchase, then using the patterns that emerge to determine consumer habits and improve the way you put your marketing message in front of them. The world of marketing is getting more and more precise. We’re able to track more information than ever about our customers, which means we know more about their behaviors and can anticipate how to respond. That means we’re able to get the right message in front of the right person on the right platform in the right time, if we gather the right information. 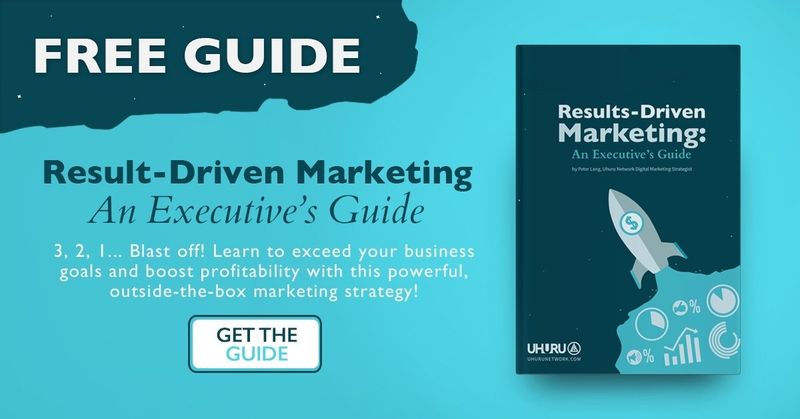 Data-driven marketing works to eliminate any guessing involved in your marketing, in turn making it more efficient, more effective, and delivering a higher return. One final thing to consider about data-driven marketing is competition. If you’re not already actively engaged in this essential marketing practice, you can bet your competitors are. The world of digital marketing is getting more competitive every day, and the level of precision necessary to be truly successful is steadily increasing. Stay ahead of the curve and start analyzing your customer behaviors to make the most of your marketing. Every business will create their own data-driven marketing strategy based upon their industry and unique customer base. However, the process of how that strategy is developed will look very similar for most businesses. You’ll need to evaluate how, when, and where your customers buy in order to define the buying habits, purchase habits, and consumer data that you’ll use to optimize your marketing. When I say that you’ll need to analyze “how” your customers buy, I’m talking about everything leading up to the purchase. Depending on what it is that you sell, your customers will interact differently with your brand before making the decision to buy. Some companies will see most of their customers visiting their site ready to buy. Others—especially those selling a product or service with a higher price tag—will find that they need to interact with their customers several times, across multiple platforms, with different messages before they decide to purchase. Take a look into how your customers find your brand and how long it takes for them to complete their purchase. Identify key steps in the pre-purchase process in order to determine where your marketing messages are moving them forward along the buyer’s journey, as well as areas where people are getting hung up or losing interest altogether. For example, if your content marketing is driving a significant numbers of awareness-level traffic with blog posts, converting them to consideration-stage leads with a downloadable offer, and then losing them at the decision stage and never actually getting them to convert, you’ll need to look at what you can do to lower your barrier of entry, build more trust, or establish your brand as the right choice to meet their need. This could be something as simple as adding a money-back guarantee and examples of social proof to your site, or designing a paid advertising retargeting campaign that showcases these new additions and works to convert consideration-stage leads to the decision stage and eventually to making a purchase. Are there peak times, days, or seasons that your customers buy from you? Are there items or services that sell better at different times of the week or day? Businesses have long gathered seasonal trends to identify when to run sales and promotions or launch a new product. With all of the information available today, those trends can be measured on a much smaller scale. Data-driven marketing is all about the little things that add up to facilitate major improvements. Look for times where your customers are spending more and compare that data with the times that you are running paid advertising to find a sweet spot that gives you your highest return. You may find that it’s worth paying more to reach your customers during peak buying times, just as you may find that the cost for advertising to your customers during those times nullifies the benefit of the added volume. The platform on which your customers buy may not be the one where you originally reach them. In fact, they may bounce back and forth between their phones, desktops, and tablets several times before making their purchase. The important pieces to identify are what platform they’re spending most of their time on, what they’re doing when they visit from various platforms, and where they actually convert. Many brands are focused on the places where their customers convert, however, in data-driven marketing it’s important to understand where they are spending their time during each phase of the buyer’s journey. For example, your customer may find your brand or a specific product via a mobile advertisment on Instagram in the morning, do their research via desktop during their lunch break, and convert on a tablet while watching TV on the couch that night. If you found this to be a common trend, you might optimize your marketing to spend more on paid mobile ads around your awareness-stage marketing message. You’d also want to optimize your website into a conversion engine that takes these awareness-stage leads and gives them all of the content (information, reviews, and/or social proof) they need to carry on toward the decision stage. Finally, you’d invest in a mobile remarketing campaign for your site visitors to keep your brand at front of mind and motivate a purchase. One of the important things to keep in mind with data-driven marketing is that insights from each channel should be used to develop your overall strategy. It’s likely that your customers have plenty in common, no matter how they find you. Don’t keep Facebook Ads insights separate from organic search insights. Instead, use them to fine tune activities on their respective platforms AND anywhere else you’re marketing. Paying attention to your customer trends is a great place to start, but if you really want to get data driven, start segmenting. Look for the group of your customers who represent the highest lifetime value and focus on analyzing their buying habits, purchase habits, and consumer data more closely. This information will help you reach more people just like them. Data-driven marketing is all about developing a close relationship with your customers. The more you understand them, the more effectively you’ll be able to reach them. Always be searching for a new way to analyze buying habits, purchase habits, and consumer data. Technology is advancing like never before, and new tracking methods are always right around the corner. The more closely you can follow the needs of your customers, the better you’ll be at presenting the right marketing message on the right channel at the right time. Purchase decisions are made in an instant, and your customer relationship will help to ensure you’re the one who’d there in the right moment. You have the customers, the technology, and now you have the know-how. It’s time to implement data-driven marketing. Remember that no marketing activity is perfect, so continue to test as you go. The more you test, the easier it will be to identify weak points and the better you’ll be at reaching your customers the right way.